A new Ipsos Reid poll puts Stephen Harper’s Conservatives ahead of Justin Trudeau’s Liberals, including in vote-rich Ontario. 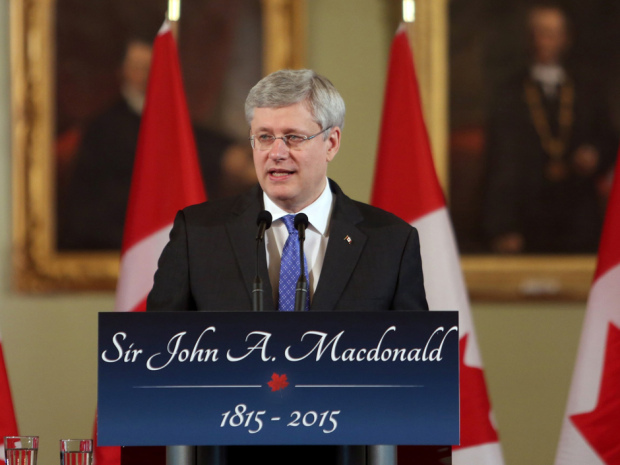 If the federal election were held today, 35% of voters would vote Tory, according to the latest Ipsos Reid poll. With new boundaries coming in 70 ridings, the Conservatives are closer to a majority government with that 35% than ever before, said Ipsos Reid’s John Wright. “If you took the 2011 numbers and applied them to the new riding situation immediately — without having a campaign or anything — the Conservatives already gain 22 extra seats as a result of that,” Mr. Wright said. The Liberals have fallen three points since December, to 31%. Thomas Mulcair and the NDP remain steady at 24%, down seven points since the 2011 federal election. The increased support for the Conservative party could be reflective of the shaky economy as the price of oil continues to drop, Mr. Wright said, and Mr. Harper could also be benefiting from a vocal stance against terrorism. “Two key planks that always emerge as a strong suit for the Conservatives over the other two parties are always the economy and national security,” Mr. Wright said. Mr. Harper’s approval rating is at 49% – the highest since March 2012 — according to Iposos’ polling from the last quarter of 2014. The Conservatives have also surged past the Liberals with 41% support in seat-rich Ontario. The Liberals are at 34%, down three points. “The Liberals are not doing as well in Ontario, and Ontario really is the key to this,” Mr. Wright said. The poll found that the Bloc Québécois had 25% support in Quebec. Elizabeth May and the Green Party remained at 4% nationally. One in five Canadians are still undecided. Mr. Harper said in year-end television interviews that he remains committed to the Oct. 19 vote prescribed by the fixed-date election law but some believe he may still favour a spring election, before Mike Duffy goes on trial on bribery, breach of trust and fraud charges related to his time as a Conservative senator. There are 30 new ridings at play. To date, no party has nominated a full slate of candidates, including the Conservatives. The poll was conducted between Jan. 6 and 11, 2015, with a sample composition reflective of the adult population according to Census data. The poll is accurate within +/- 2.6 percentage points. It's no wonder that the conservatives are ahead, not that they deserve to be but they just happen to be the less of the evils of gutless politicians who are too afraid to speak out with one exception. Tom Mulcair so far is one of the few politicians who has put social policy ahead of good politics, that is long term planning for Canada rather than short term political point scoring. If Tom Mulcair had been a liberal, it might be a different story. The problem is, Liberals are traditionally corrupt, and in Ontario have stacked the Judiciary with a cess pool of Father Hating Corrupt Judges many of whom are anointed to the Judiciary after years of Criminal Fabrication of Evidence with Ontario's largest Criminal organization, the Children's Aid Societies of Ontario. Every Ontario Resident should be concerned about a rumored Liberal anointment to Judiciary of Marguerite Lewis, perhaps one of the most notorious unconvicted Domestic Terrorists in Ottawa. This vile Child Abuser personally fabricates evidence and even Sgt. John Gibson of the Ottawa Police concluded after examining transcripts that "She lied to the judge, it's perjury". That conclusion was quickly shattered upon a phonecall from another Domestic Terrorist and professional offender against the Administration of Justice Tracey Engelking who like most CAS lawyers can get what ever order she wants direct from a judge without a hearing. Recently this professional child abusing criminal sought and obtained an order for custody of a child to, one of Ontario's most violent mothers, without a hearing or notice to the father, a male victim of domestic violence, a prime target for Ontario's Domestic Terrorists who work for the CAS.